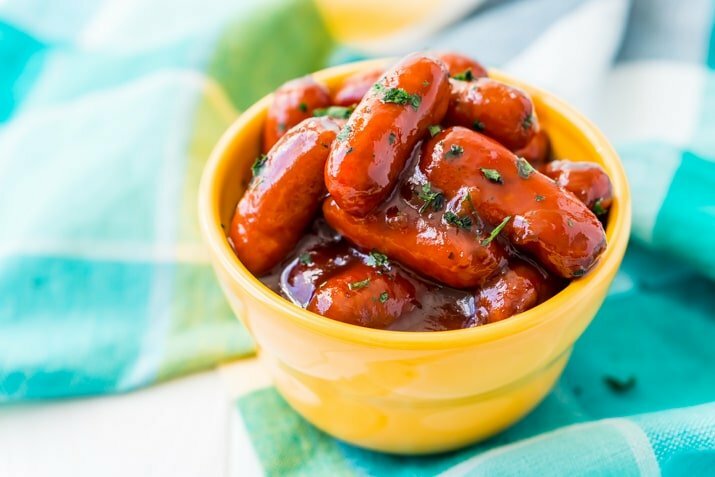 These Peach Barbecue Little Smokies are going to be an instant game day party hit! Made in the slow cooker with barbecue sauce, peach preserves, and cayenne pepper, it’s an addictive appetizer recipe everyone will love! Can you believe that this year’s Superbowl is just around the corner? In a couple weeks that iconic Sunday will roll around, filled with jerseys, drinks, creative commercials, and of course, food! If you’re planning on hosting a party yourself, this two-week countdown may send you into a panic. But don’t worry, you’ve got plenty of time, and I’ve got plenty of easy, delicious recipes to share including Peach Barbecue Little Smokies. I’m not really a huge sports fan, but I love Superbowl Sunday because of what it represents: getting into the game-day spirit, hanging out with friends and family, and eating lots of tasty snacks! During this unofficial “holiday,” there’s no need to dress up or serve anything complicated or fussy. It’s all about relaxing, having fun, and chowing down on everyone’s favorite finger foods. 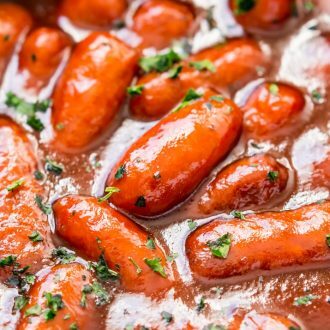 In this mouthwatering recipe for Peach Barbecue Little Smokies, the famous mini sausages are marinated in a sweet, savory sauce that has a kick of spice. Better yet, you only need four ingredients to make it. Simply toss the Smokies, peach preserves, barbecue sauce, and cayenne pepper into a crockpot, and… well, that’s about it. 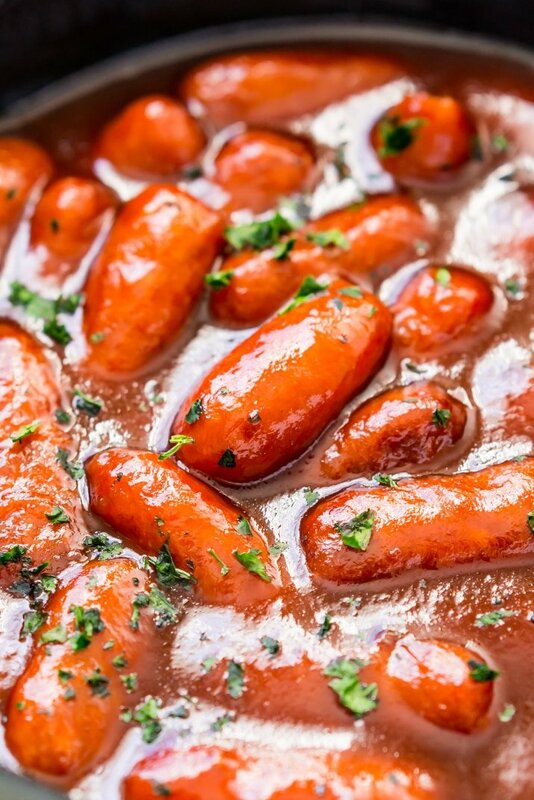 When Peach Barbecue Little Smokies are finished cooking, you’ll have a batch of bite-sized sausages smothered in a thick sauce, the tangy and smoky flavors satisfying to all your taste buds. In fact, you may want to keep a pile of rolls nearby for extra dipping! What’s more, this appetizer is easy to transport if you’ve been invited to someone else’s big game party. Leftover or re-heated, Peach Barbecue Little Smokies are always scrumptious. I’d even pair them with scrambled eggs for breakfast on Monday morning! 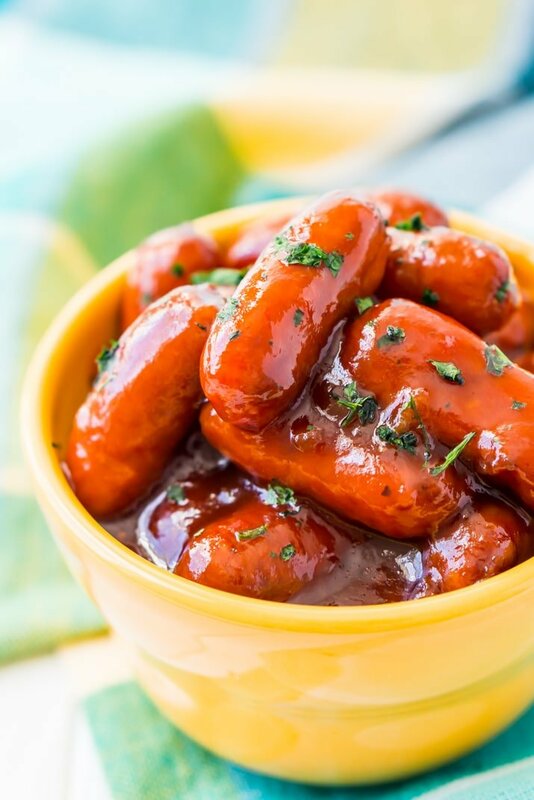 Peach Barbecue Little Smokies put a tasty spin on everyone’s favorite mini sausages. Sweet, savory, smoky and spicy, these addicting little bites will be a hit while you’re watching the big game. How Do You Prepare Little Smokies? 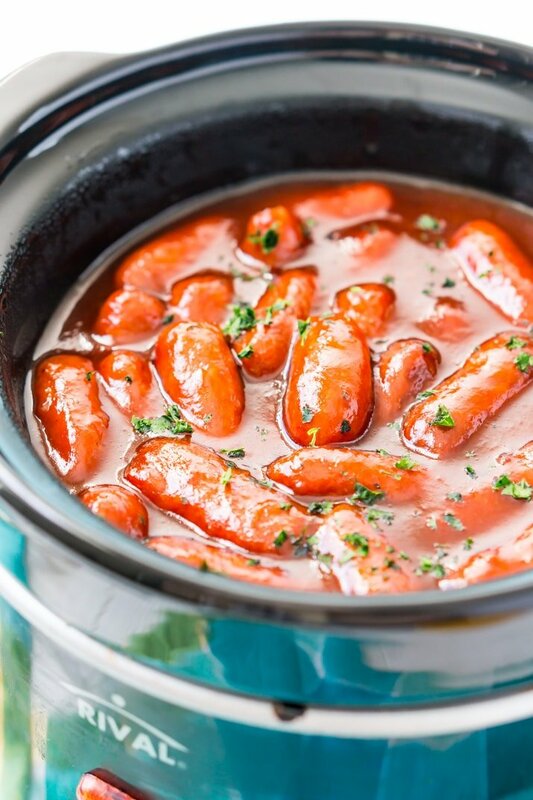 How Do You Cook Little Smokies in a Crock Pot? Cook on high heat for 2 hours or low heat for 3 to 4 hours. Turn to warm if you’re serving during a party. Add all ingredients to a slow cooker and stir together and cook on high for 2 hour or low heat for 3 to 4 hours. Keep warm while serving and refrigerate leftovers. 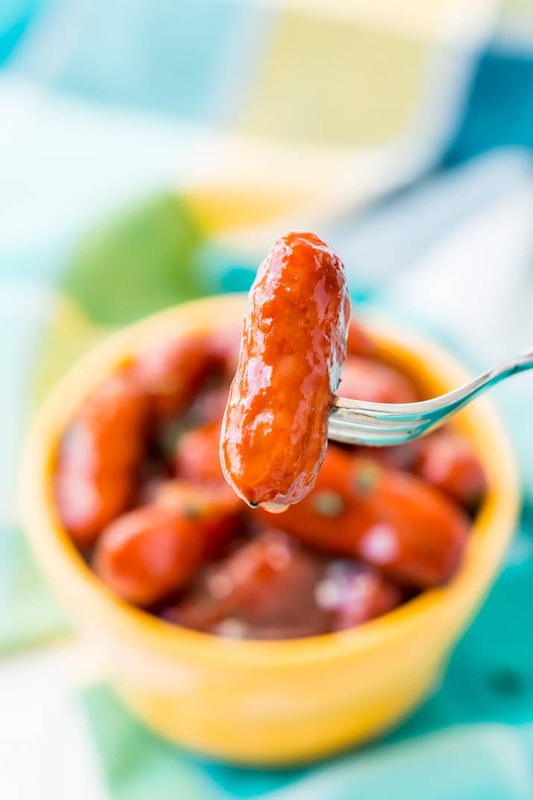 Pin this Little Smokies Recipe for Later! What a delicious snack and appetizer for game day! The peaches sound like they’d be so good in the sauce! What a great way to use peach preserves. I make my own sometimes and this recipe would be an awesome way to use them! I bet your homemade preserves would make these even better! What a great recipe! I enjoy the little sausages and best when have different sauces and flavors. This is a perfect appetizer for football season yummy! Yes, different sauces always make them more enjoyable! I love the sound of these, sadly little smokies don’t exist on this side of the Atlantic but the sauce sounds glorious! This would be a great sauce to use with frozen cocktail meatballs as well! It says to use chili sauce on the ingredients but it isn’t mentioned at all in the description…do you use it or not? Thanks! Hi Rachel, as stated in the recipe, ALL INGREDIENTS are added at the same time.